Upper Prospect Avenue in the 1890s around Woodstock Place was sparsely settled. It was near the end of the Farwell Avenue car line with the carbarn located where the Oriental Theater now stands at Ivanhoe and Farwell. Because there wasn’t much there it was a good location for hospitals and rest homes. In November 1894, Dr. Horace Manchester Brown opened his new surgical hospital at the northeast corner of Woodstock & Prospect and named it the Manchester Brown hospital. It was a small hospital that looked more like a German hunting lodge than a medical facility but the inside was modern for the time and cost $18,000 to build. What made it unique was the fact that it was the first strictly non-sectarian hospital in the city. In 1915, Ford Motor Company bought the property across the street and began plans to build a large automobile plant there. Dr. Brown pushed hard against the proposed plant and filed a lawsuit which he didn’t win but the furor led to stricter zoning laws preventing manufacturing from being built that close to a residential district. Shortly after the factory opened Dr. Brown closed the hospital. In a strange twist of fate the factory was taken by the federal government late in 1918 to be used for a medical hospital during the war. 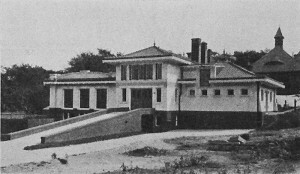 Meanwhile in 1919 the old hospital had been bought by the Country Day School for use as a Junior School until it moved to new facilities in Whitefish Bay in 1932. 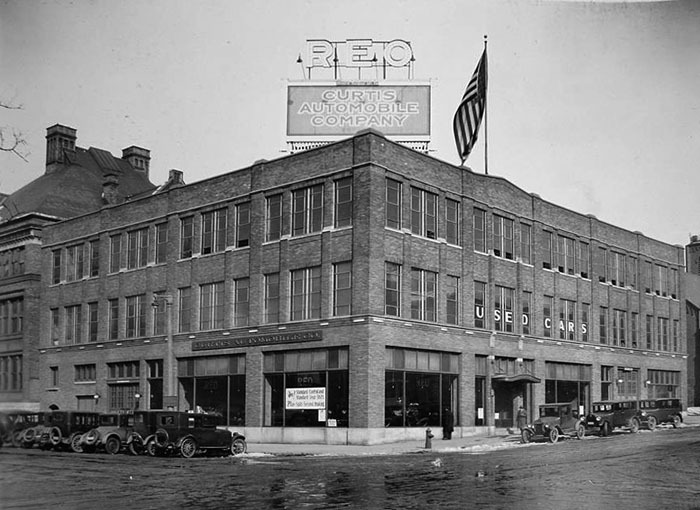 The building sat vacant until it was torn down in 1934 for the proposed Milwaukee Western Fuel Company offices. 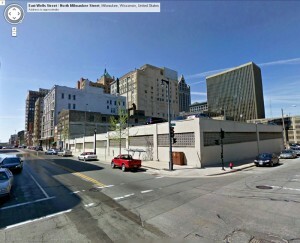 That building was a modern art-deco building designed by Milwaukee architect Herbert W. Tullgren. Big thanks to Gary Rebholz for providing a picture from his research on Milwaukee’s German Newspapers and the idea for this article! For those of you that know only the blog section of the website you may want to explore a little further. 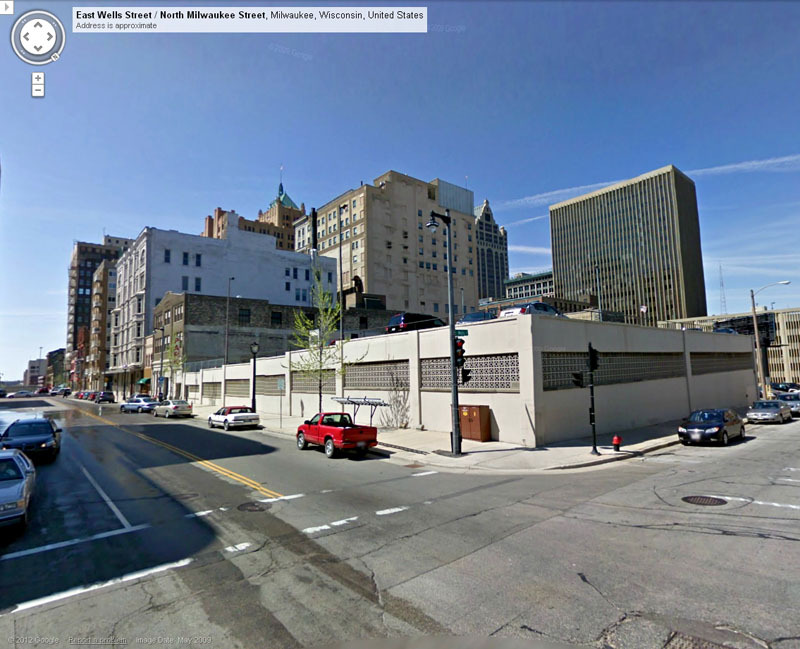 There is a steadily growing and updated database of downtown Milwaukee buildings. 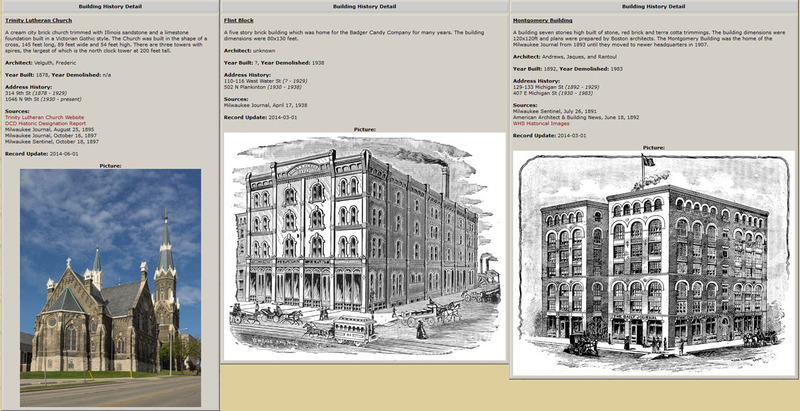 This database lists brief histories of existing and old buildings, some of which are long gone. You can use the “Downtown Building Database Search” many different ways by searching by architect, building name or just by looking to see what is newly added to the list. I have been taking pictures of existing buildings to add to the database, finding older building images to scan, and doing extra research to find more information. This resource will continue to expand so check back often! Last year I was browsing the Library of Congress website doing research on some of their photographic collections of Milwaukee material. I was already familiar with the work of John Vachon, a Farm Security Administration (FSA) photographer who had spent some time in Milwaukee in September 1939 and was browsing his work. Some of the catalogued pictures had no descriptions but obviously were from the same date as other pictures from Milwaukee. 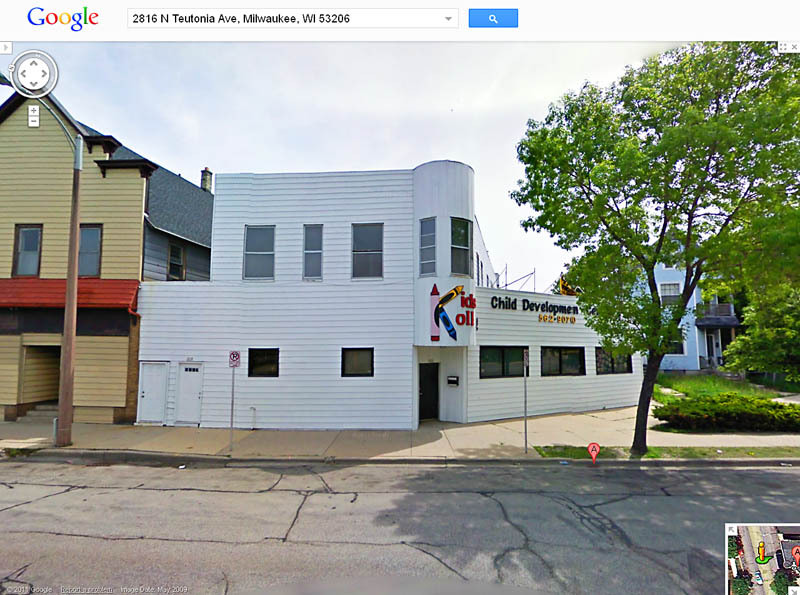 This one in particular intrigued me because it was a Milwaukee-style building but I did not recognize it at all. It stayed in the back of mind for months but it was a building that was long lost or from somewhere else. Today while looking through some images I have scanned from other sources I came across this picture and recognized it almost immediately. It was the mystery building right in the heart of downtown! I still have yet to piece together the history of the lost building but now I have an address which is a start. Sometime in the 1960s it was torn down to make way for this nondescript parking structure. In the 1930s and 1940s, the effort was underway to give Milwaukee a more modern appearance. This was usually done by tearing down old buildings and building new. It was usually cheaper to take an old building and make it look modern. 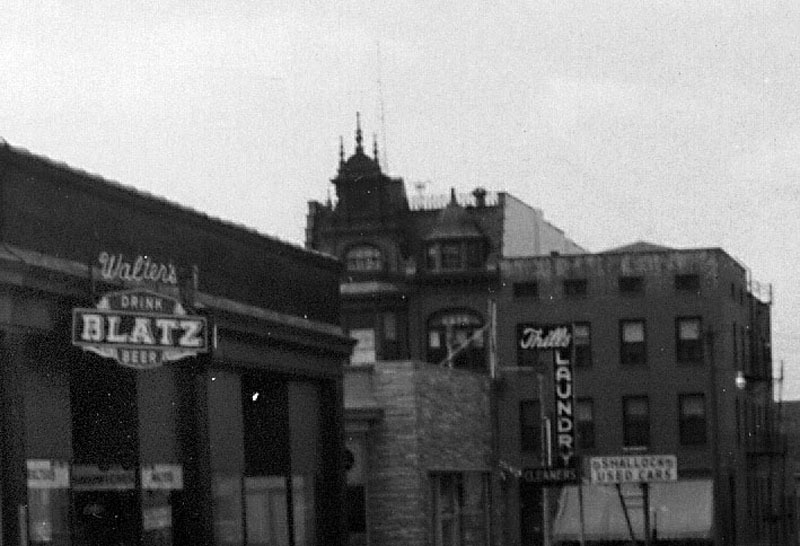 Sometimes this was effective as was the case with Lou Fritzel building at 733 N. Milwaukee St and also the building shown below on N. Teutonia Ave. Although with the passing of time and less attractive renovations the building doesn’t appear too modern anymore. 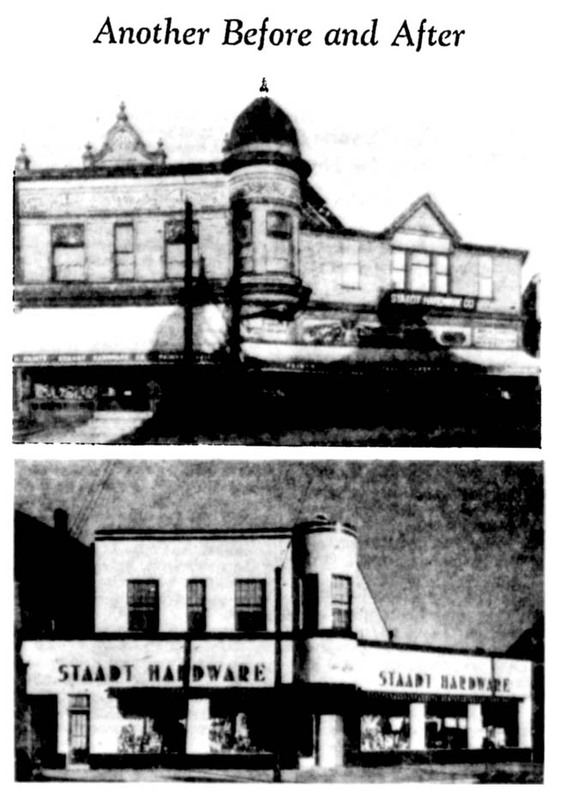 The remarkable improvement that can be made in soundly built old structures that are out of date in style is shown by the transformation of the Staadt Hardware Co building at 2816 N. Teutonia av. The pictures show the building before and after. Alexander H. Bauer, Milwaukee architect, designed the remodeling, using Lustron, a new enameled steel with a glass finish, to veneer the exterior. The new material is handled by Porcelain Building Products, Inc.
As it look now, via Google Maps. On North 19th Street, just north of Wisconsin Avenue lies a building that is the home of Channel 12. It has a modern appearance but at the core of the building remains a garage and stable that was built over 100 years ago for the estate of Charles Norris which was located on Grand Avenue next to the Pabst Family mansion. The Norris family were known for their business which provided provisions for ships in 19th century Milwaukee. Charles married the daughter of Daniel Wells Jr.
We publish a photograph of the fireproof horse barn and automobile garage recently completed for Mr. Chas. W. Norris, 1906 Grand avenue, Milwaukee. The building was designed by Architects H. C. Koch & Son and was built by S. J. Brockman, all of Milwaukee. Concrete is used liberally in the construction. The floors and roof are of reinforced concrete, the reinforcement of the roof being furnished by the Trussed Concrete Steel Co., of Detroit. Steel roof trusses are also used as roof supports. The walls are brick and hollow tile plastered on the outside with white cement. Green tiles serve as roof covering. There is no wood in the building excepting the doors, windows and harness cases. The general dimensions are 81×46. There is electricity, a small hot water heater and plumbing. The conveniences include space for six or seven autos and horse carriages, a large washroom, three box stalls and two smaller ones, a hayloft, and in the basement a place for chickens, dog kennels, etc. 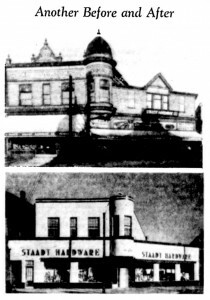 Among the sub-contractors were Biersch & Niedermeyer, tile roofers, and Dearsley Bros., plumbers. The view from the south parking lot shows the building as it now appears. Although much changed and added onto the original structure still can be seen. Now the real question is whether there are still chickens kept in the basement? Back again to see who can guess where the mystery building in the accompanying photo was located. 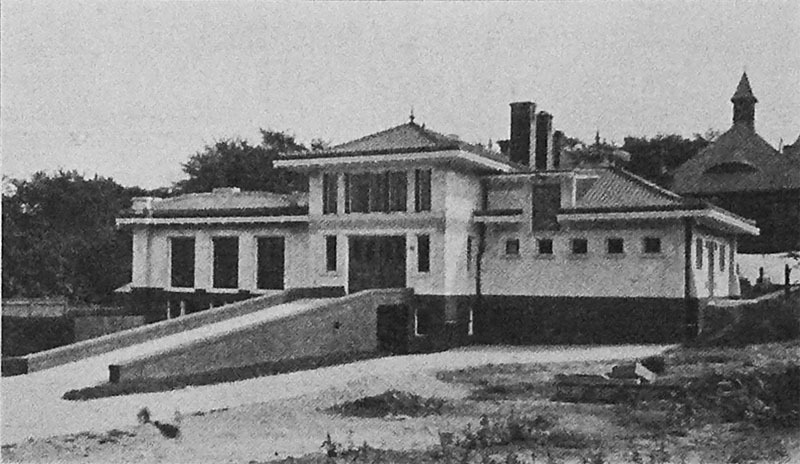 This building is still there although I doubt anyone can recognize it. Hint – it is no longer a car dealership. Where was the mystery building? 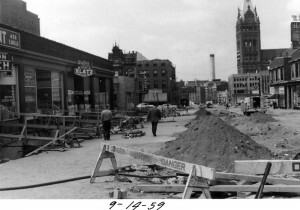 The beginning of the push towards redevelopment of the short 700 block of North Milwaukee street began in the early 1990s. Now, this block is very vibrant with a large amount of clubs and restaurants and continues to improve. It stands as a link in the chain of popular East Town businesses that continue along Mason Street and up Jefferson Street. It is interesting to see how Daniel McCarthy of the City DCD could not foresee the elements that would eventually transform the area. The older property owners could not envision that the moving force for development would be entertainment spots that drew a younger, urban crowd to the area. This was in opposition to the marketing which tried to keep businesses which sold upscale linens or wanted department store shopping like Chapman’s. Nevertheless, the Curry-Pierce building presents an iconic, old-world face that invites people to the Milwaukee Street area. The 700 block of North Milwaukee Street has some of downtown’s oldest — and emptiest — buildings. That reflects both the potential and problems of the surrounding neighborhood, developers and city officials say. The buildings’ historic and architectural character can attract tenants. But restoring the buildings while maintaining their character can be costly. The area got a boost this week when TMB Development Co. announced plans to spend $2.7 million renovating two historic buildings at the northeast corner of North Milwaukee Street and East Wisconsin Avenue into retail and office space. The project, known as Curry-Pierce, is important because “it speaks a great deal to the confidence in the area,” said Daniel J. McCarthy, of the Department of City Development. Curry-Pierce, which includes a building that dates back to 1866, shows that downtown’s older buildings can be restored for commercial use, said Thomas H. Miller, of the development department. 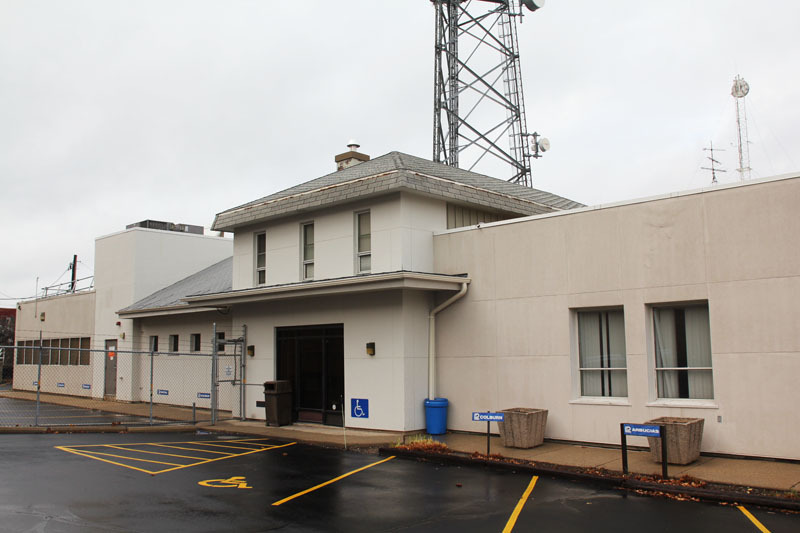 The project also will remove a highly visible eyesore that scared away prospective developers and tenants, said Thomas Gale, a real estate broker with The Harrigan Co. and vice president of the East Town Association, an organization of downtown businesses, institutions and residents. Mark Gleischman, whose GS Properties owns older buildings at 715-723 N. Milwaukee St., said the TMB project is good news. But Gleischman said Curry-Pierce won’t necessarily bring other developments to the block. “I don’t know that it signals the beginning of a trend of any kind,” he said. East Town — an area bounded by Lake Michigan, the Milwaukee River, East Ogden Avenue and East Clybourn Street — was once home to a posh retail area in the 700 blocks of North Jefferson and North Milwaukee streets. But the opening of the Grand Avenue retail center in 1982 drew shoppers to downtown’s west side. Also, the T.A. Chapman Co. department store, a retail anchor for East Town, closed in 1981. An office tower at 411 E. Wisconsin Ave. now stands where the Chapman store was. “When Chapman’s went out, that sort of doomed Milwaukee Street,” said George Watts, chairman of George Watts & Son china, silver and crystal shop at 761 N. Jefferson St.
Watts says his business has thrived because its customers are willing to come downtown. Watts said stores in East Town need to offer specialty products that will draw sophisticated customers from the suburbs and beyond. One such store, however, moved from East Town to Mequon in 1991. Percy’s, an upscale linen and clothing store, moved from 719 N. Milwaukee St. after 10 years at that location and another 10 years on North Jefferson Street. Thelma Percy, who operates the shop, said the Milwaukee Street block had nine empty storefronts. That made it harder to draw customers, she said. She also said the area didn’t have enough parking, something echoed by Watts. Percy’s now operates at 11041 N. Port Washington Road. McCarthy said East Town has a lot of parking spaces with short-term meters. The department needs to study ways to keep East Town office workers from using the spaces all day, he said. Another possible solution is valet parking, McCarthy said. HP said a city-owned parking structure at North Milwaukee and East Michigan streets could be used. An estimated 45,000 workers are in East Town’s offices and businesses daily, McCarthy said. He said the department, property owners and the East Town Association should find better ways of learning what goods and services those workers want. That information then should be used to more aggressively attract retail businesses to East Town, McCarthy said. That could draw businesses like drug stores or dry cleaners, he said. Even if those moves were successful, however, there would be other vacancies to fill. Retail businesses, whether specialty shops like George Watts or services like dry cleaners, like to be on the street level of buildings. Upper levels are generally used for offices and residences. Charles Trainer, a partner in TMB Development, says TMB’s Curry-Pierce project will attract other retail businesses to the block. But Trainer said it will be harder for the block’s other buildings to fill their upper levels. Unlike Curry-Pierce, the other buildings are in the middle of the block and have less window space, making them less attractive, he said. “It’s a tough one.” Trainer said. Gleischman said the buildings owned by GS Properties have retail businesses on the street level but have had vacant upper levels for several years. McCarthy said the demand for downtown office space, which is low, will eventually rebound. He also said more apartments and condominiums are being built downtown. In the meantime, Watts said East Town should market its other advantages: relatively low rents, a safe atmosphere and a cultural vibrancy. Ever since Milwaukee was established as a mere trading post, during its village days, down to and including the present time, East Water street, the first of the great thoroughfares to be laid out, has held a commanding influence on the trade and commerce of this great city. This is due to the fact that of all the streets it is by nature and location the best adapted for business purposes. Solomon Juneau and Jaques Vieau when they established the first trading post along the Indian trail which ran parallel to the river, never dreamed that they were laying the nucleus for one of the greatest wholesale and retail thoroughfares in the western country. Yet they came here to do business in their small way and in selecting the place instinct or good judgement guided them to locate on the natural line of travel. For centuries previous to the coming of the white man, the Indian had a trail along the route now traversed by East Water street which led to the peace grounds, near the mouth of the river, which has played such an important part in the development of the commercial greatness of Milwaukee. It was in 1818 that the the first trading post was established here, and when the white settlers, following in the footsteps of the founders, began to come in the early thirties those who located on the east side of the river endorsed the good judgement of the first traders in locating along the river by building their homes and their small places of business along that same old Indian trail. When the character of the buildings and the great volume of business which is transacted on the East Water street of to-day is considered, it is hard to believe that less than half a century ago this great emporium of trade was little more than a wagon road with a few houses, widely separated, constructed of poor material and scattered from Walker’s Point bridge to Racine street. It was in 1818 or 1819 that the first building, a rudely constructed log hut covered with cedar bark, was built for the accomodation of traders during the winter months. In the summer the men of those days had the blue sky for a shelter. From that time until 1832 there were a few cabins erected for the acommodation of the traders. It is in 1832 or about that time that the real business history of the street begins. The first frame house built in Milwaukee was a 12 by 6 box erected by Solomon Juneau on the present site of the Pabst office building, in 1824, and was used as a school, a justice shop, the recorder’s office and a barber shop. The building had a historic interest aside from its origin in that Scott and Bennett, two men accused of an Indian murder, and the first to be charged with such a crime in this community, were incarcerated here for a short time, and this was the only punishment which was ever meted out to them. Between that time and 1835 there were a few similar buildings erected. In the latter year there was a change; emigration began, settlers poured in freely and the village of Milwaukee began to assume proportions beyond that of a mere trading post. Commerce commenced to grow and it was no longer confined to the mere bartering of trinkets for the furs of Indians. Warehouses and general stores were established and the supplying of the demands of the white settlers became a more important branch of business than the Indian trade. This was made possible by the development of the agricultural interests of the immediate surrounding country. The extent of East Water street as a business thoroughfare in that year may be gleaned from the fact that the total population of the settlement was about 3,000 and that on the street which is so crowded to-day there were only a few houses and stores. But even then it had a greater proportion than other sections. On the east side of the street beginning at Buffalo street there were the houses of George Bowman, the cottage inn, Col. Morton’s, Juneau’s, Jonah Brown’s restaurant, George Peter’s saloon, U. B. Smith’s, Benton & Parmlee’s shoe shop, J. Rowell’s, Hayden’s grocery and Levi Blossom’s auction shop. North of Wisconsin street were the stores of C. C. Dewey, Harrison Reed, Lee & Thurston, J. L. Smith and Jas. Murray. On the west side of the street were the Dousman warehouse, wagon shop of Hiram Smith and the stores of Finch & Winslow, Higbee, William Payne, George Bowman, William Brown, J. Stoddard, J. C. Shermerhorn, Richard Hadley, John Gale, Weber & Starke, C. Shepard, G. Cady, A. O. T. Breed, Samuel Brown, D. S. Hollister, Luddington & Burchard, D. L. Week, J. W. Pixley, M. W. Cawker, D. W. Patterson, and Prentiss & Bird. These incuded general stores, shops, saloons, hotels or, as they were called at that time, taverns, and every description of business necessary to supply the wants of a growing frontier settlement. 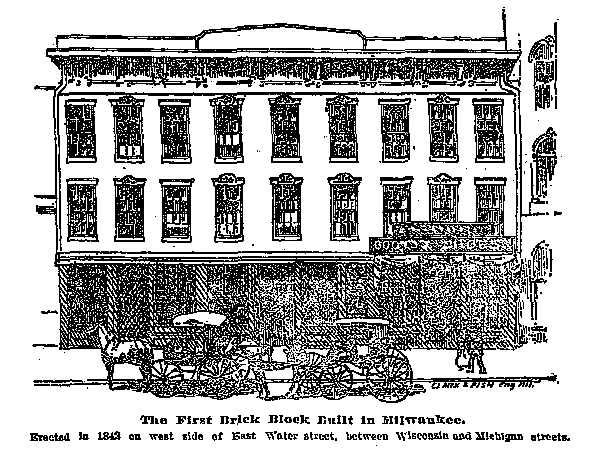 In 1840 the settlers were surprised at the energy and faith of C. C. Dewey, who erected the first brick building in Milwaukee on East Water street. Mr. Dewey’s block, which years afterwards became the Heide block, was a three-story structure which occupied the place on which is now located the Hansen Empire fur factory. It was divided into three stores and William Sivyer, Milwaukee’s first master mason, was the contractor. 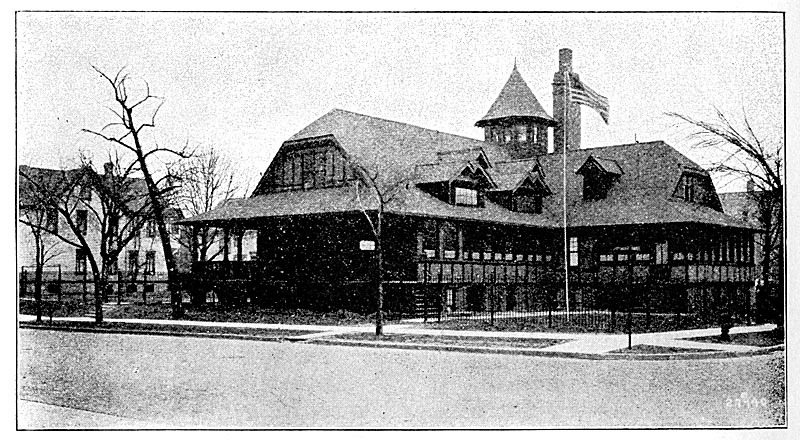 Mr. John E. Hansen who is among the public-spirited business men of to-day, is the possessor of a photograph of this building from which the cut accompanying this article is made. From that time until the period of depression during the administration of Buchanan in the latter part of the fifty’s, East Water street grew rapidly. The frame buildings were, according as they had outlived their usefulness, replaced by brick buildings, the marsh on the west side and south end of the street was filled in, and every foot of the property was brought into use for business purposes. It is remarkable to note that in the directory of 1847 attention is called to the blocks and buildings of the city and among those were the following located on East Water street: Chapin’s Cheapside, Heide’s and Johnson’s. The street even then gave promise of its future commercial greatness and it was well built up, nearly all of the leading business houses of the city were located on it. Many of the firms which are there are a credit to the city to-day had made their beginnings at that time. Perhaps the most noted example of this class is that of Chauncey Simonds, who located on East Water street in 1845 and has continued ever since in the same neighborhood, developing his business with the growth of the city. In some respects the East Water street of the early days was a much livelier thoroughfare than it is to-day, although more people pass through this street in a single day now, and any one of a half dozen of the leading firms do more business in a day at the present time than was done then in a month. This lively appearance was owing to the crude and undeveloped means of transportation and the methods of doing business. Myriads of farmer’s wagons, of one horse drays teetering up and down and making an incessant din which was increased by the bobtail carts at all times thronged the street and made it at the time the most lively and enterprising business street in the western country. The buildings for the most part were frame and during the early years of development many of them were wiped out by fire. The most disastrous of the early fires was the conflagration of 1857, which destroyed a half a block south of Wisconsin street on the east side of the street. But through the fires were in a measure disastrous, in the end they proved to be a blessing for all of the burned structures were replaced at that time by more modern brick buildings, more roomy and better adapted to the necessities of the growing trade.